But buyers are much more excited about this season’s new offerings, giving them a more enthusiastic response during May’s upfront representation than any other network’s new lineup. And even though the freshman shows they’re most eagerly anticipating—24 reboot 24: Legacy and Star, another music-themed drama from Empire creator Lee Daniels—won’t debut until midseason to help fill the void left by American Idol’s departure, Fox seems to be on more solid footing than usual this fall thanks to some big swings and one very strong Pitch. I’ll repeat this all week: Even though a pilot isn’t always the best way to judge a show’s potential, it’s frequently the only episode that audiences watch before deciding whether to stick around for more or cut bait forever, especially with so many new and returning shows competing for their attention. And it’s the only one that advertisers and buyers see before deciding where to direct their upfront dollars. 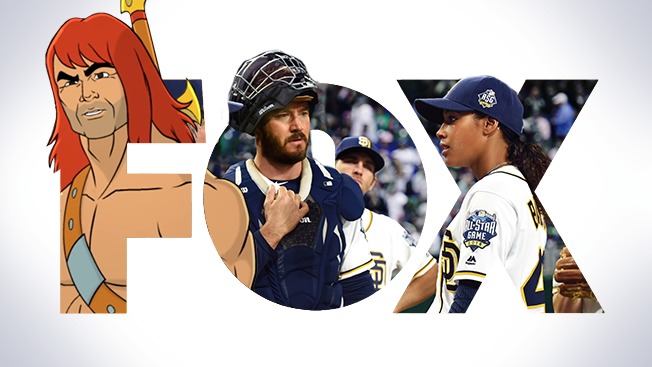 So with all of that in mind, here are Fox’s four new fall shows, ranked from least promising to most promising. The plot: A churchgoing mother (Geena Davis) worries that a demon has targeted one of her daughters and enlists two very different priests to investigate the eerie events happening in her home. The series also references the events of the classic 1973 horror film about demonic possession, and yes, it features more kids whose bodies have been overtaken by evil entities. The verdict: It’s better than the film-to-television adaptation Fox put on the air last fall—the DOA Minority Report—but not by much. The pilot desperately tries to be creepy by invoking run-of-the-mill horror tropes like ominous music, power outages and illogical jump scares. Davis is given little to do in the early going (though that should change as the story unfolds), while the appearance of the movie’s iconic theme song, “Tubular Bells,” serves only to highlight the extent to which this version fails to measure up to the original. Is it good for your brand? There’s little upside here, unless you sell green pea soup (though unlike the movie, no possessed character has vomited onscreen—yet), especially in a Friday night time slot that Fox has all-but-abandoned in recent seasons. With NBC’s Grimm held until Jan. 6, this could be backup plan for brands looking for horror audiences on Fridays, but FX's American Horror Story would be a safer bet in that genre. The plot: The live-action/animated hybrid centers on an animated, He-Man-like warrior named Zorn (voiced by Jason Sudekis) who takes a hiatus from fighting battles on his Pacific Ocean island and heads to Orange County, Calif., where he hopes to win back the affections of his estranged, human son (Johnny Pemberton) and ex-wife (Cheryl Hines). The verdict: The last high-concept Fox comedy from executive producers Phil Lord and Christopher Miller, The Last Man on Earth, debuted with a sensational pilot that completely delivered on its inventive premise. Zorn’s debut, however, is much less assured, as most of the fish-out-of-water jokes fall flat. The supporting cast is fine (particularly Tim Meadows as Hines’ often-emasculated psychology professor fiancé), but the animated Zorn, ironically, is the least sketched out of the cast, with no clear indication as to why Hines might have once been drawn to him, and vice versa. There is potential, though, especially when other elements of Zorn’s world are added to the mix, and given that the show is slotted between The Simpsons and Family Guy, it should have ample time to find itself. Is it good for your brand? If you’re already advertising on Fox’s other Sunday night comedies, whether animated or live-action, then this hybrid will fit right in, unless you’re in the “death hawk” business (they don’t fare too well around Zorn). The plot: The hit Mel Gibson/Danny Glover action franchise is rebooted on the small screen, with older L.A. cop Roger Murtaugh (Damon Wayans) returning to the job after a heart attack. He's paired with a reckless and potentially suicidal new partner from Texas, Martin Riggs (Clayne Crawford), who is still an emotional wreck after the deaths of his wife and their unborn child six months earlier. The verdict: Much better than I would have expected, and than the show probably deserves, thanks to the dynamic chemistry between Wayans and Crawford, who are doing far more here than just imitating Glover and Gibson, respectively. (Crawford, who on SundanceTV’s Rectify has found untold layers in what could have been a one-dimensional role, does some impressive heavy lifting here as well to elevate Riggs beyond what existed on the page.) The pilot is thrilling and funny, but it’s unclear what the show will look like on a weekly basis without its flashy pilot director (McG) and sizable pilot budget. Still, with Fox giving this its best time slot—leading in to its biggest hit, Empire—this could finally be the show that breaks the movie-to-TV cancelation streak. Is it good for your brand? Fox has never met a buddy detective show it didn’t like, so this should slot in nicely with buys for shows like Gotham, Rosewood and Bones. Plus, its close proximity to Empire should give it a healthy ratings boost. The plot: Pitcher Ginny Baker (Kylie Bunbury) becomes the first woman to play in the major leagues when she’s called up by the San Diego Padres. She has to navigate her role as a Jackie Robinson-like pioneer while fitting in with her leery new teammates, including the team’s captain and star (Mark-Paul Gosselaar). The verdict: One of fall’s most ambitious pilots is also one of its best, with a compelling show that could appeal to both sports fans (Fox will be promoting it aggressively during MLB broadcasts and other Fox Sports events) and viewers who like female-centric dramas. (Co-creator Dan Fogelman, who is also behind NBC’s This Is Us, is on a roll this season.) Especially with Scandal delayed until midseason, this could resonate with fans of that show looking for an alternative on Thursdays at 9 p.m. Fogelman will have to pull off a tricky balancing act to keep all these different audiences engaged, but he’s off to a very strong start. Is it good for your brand? Major League Baseball certainly thinks so, as it has partnered on the series and is allowing the inclusion of real MLB teams and logos. If the show does draw those disparate audiences, it could be one of the few new series with true four-quadrant potential, which could make it an ideal fit for brands in almost every category (and it airs Thursday night, so movie studios should take particular interest).